Very easy and could have used a few more enemies to spice up the action but otherwise it was still enjoyable to play through. Good balance throughout till the end with several small puzzles to solve, so you can retrieve the scroll. There were a few interesting effects in this one that were pretty clever, such as the sand that falls down and fills the room and the lights going out as the water rises. Nothing fustrating at all during play, puzzles are easy yet some are hidden slightly and kept at a good pace. Captures the egyption feel perfectly with fantastic texture usage, each aligned very well. The tones mix well together making everything fit with nothing out of place at all during the map. Some objects were detailed quite a bit which looked realistic. Lighting was great everywhere with no complaints, yet some other interesting lighting effects on the walls. Structure is good, kept within the theme at all times and layed out well. There was a bug however with the water, after triggering it to rise, go back the way you came and it’ll be in the large room, as it partly covers a very small section but not the rest. Easy yet very enjoyable map including some interesting effects. A good and interesting game with sets Egyptian tomb style well designed with puzzles, not sure if all trigged and ending seemed lame. I’ve always considered expanding these two maps the way I did with Vilcabamba > Idol Hunt. The problem is most of the new puzzles I can come up with would be possible only with the Source engine. I think I did most of what was possible with this theme. This is not the first effort from the author witch is well known for is fantastic demonstration map (both for HL 1&2) is last release in collaboration with Chris Fox called The citizen recieved mainly award from the community. 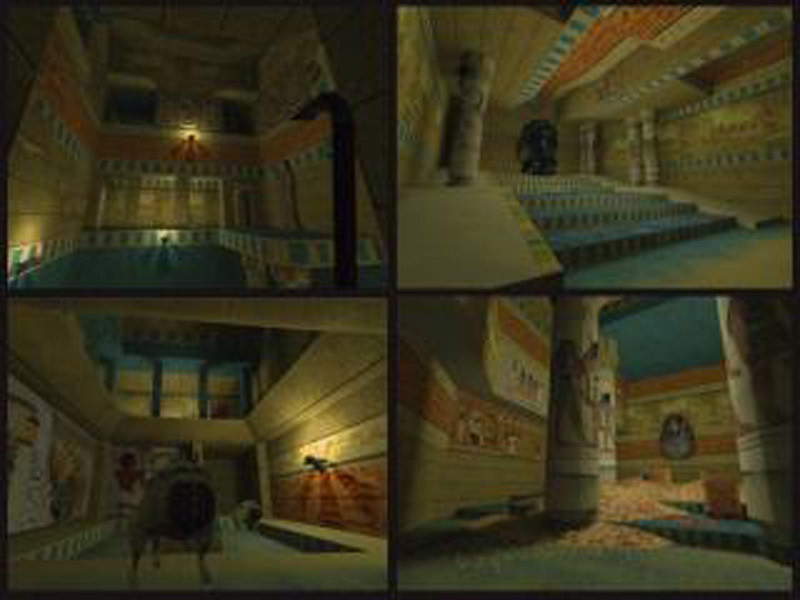 In this early one the use of custom texturing and effect was created to produce a kind of Pyramid experience. The main objective for this experience is to travel thorugh the entired pyramid complex by defeating enemies and traps and gain access to the main place to get the treasure. Design is top notch everything fits well togethern, texturing is wonderfull and even if it’s a little repetitive the architecture isn’t. Traps are omnipresent and they design is also interesting. Everything is here really handled in a professional way to create a short but unique half-life experiences. In conlcusion: this is a perfect example of a nealry perfect release: custom content, architecture, gameplay everything is so fluid handled that its a perfect fun map…sadly it’s defenetly too short but regarding the time that was spend for making this one we just need to be happy to have such a gaming experience. I found that I liked the textures that the author used in this game. Some of them look as thought they might have come straight out of the Valley of the Queens. It reminded me a little of on of the tombs belonging to a prince located there. Good Job. The puzzles aren’t generally too hard. The one where the scroll is on top of the plaform is a bit harder and has me a bit frustrated. I’m not figuring this one out. A hint would be very welcome here. Two short maps with Egyptian style (hi Lara Croft! ), very good looking. The adventure is about a scroll to be found somewhere inside, but there are traps to avoid, puzzles to solve and so on, so it ain’t that easy as it maybe sounded first. Not a bad 2-map pack here. It’s a mix of puzzles and textures, although unfortunately the puzzles are mostly of the find-the-button variety. I liked the custom Egyptian-style textures, and the map layouts are nicely done. I do think this theme could have been polished a bit with more environmental sounds and some lighting effects, but it’s decent as is. Worth a play if you like puzzles and a different setting from the normal Black Mesa desert maps.